The markets for skilled architecture photographers are huge.. Business is booming again in commercial and residential construction. Home builders, property managers, construction companies, hospitals, retirement communities, manufacturing facilities, magazines, and real estate ventures all have a use for architectural photography.That means there is business for photographers who can shoot quality photographs of homes, real estate properties, or a high rise building for an architect. Whoever you shoot for, it is all architecture photography yet each property will have a unique set of guidelines that will guide you in your photographic approach. Architecture is one of the most challenging subjects to compose and light. There are ambient light issues, color balance issues, and lighting issues. If you wish to shoot architecture photography, then this workshop is created just for you! Join award-winning commercial photographer Charlie Borland as he shares his knowledge in a step-by-step approach to photographing properties architectural properties. You will learn how to light an interior without the scene looking lit, how to manage lighting color balance, how to make the inside balance perfectly with the outside, how to find a storytelling angle, how to deal with poor light, how to fix bad color, and a whole lot more. To help you jump start into architecture and real estate photography, Charlie Borland has developed an excellent 4-week online workshop that deals specifically with the needs of photographers trying to break into the business. The Course: This online video-based course is especially geared to intermediate through professional photographers. You’ll receive a broad overview of photographic lighting, gain a good idea of how to light room interiors, and arrange a scene. The best camera gear and lighting equipment is covered as well. You will also learn how to see light quality, how to manage highlights and shadows, how to choose the right lighting accessory for the subject, why use an umbrella over a light box, and managing the color of various ambient light sources. You will learn how to light when there is no place to put your lights. And, we’ll show you the latest tricks in using Photoshop to enhance and composite your images. Equipment and how it works. Photoshop is used widely in the course and while you do not need to be an expert, some familiarity will make it easier for you. Primarily Layer Masking techniques.You will need a digital camera with a wide angle lens. For full frame sensor cameras a lens around 16-35 is perfect and if you have a cropped sensor camera then a wide angle lens around 10-20 will work as well. If you don’t have lenses in that range but do have a wide angle lens then use it for the course and learn what you need for later purchase. You need a good tripod and a cable release or wireless device to trigger your camera. I also recommend wireless triggers to fire the strobe/flashes.This course covers lighting extensively and includes several techniques. You will learn how to shoot architecture without lights, with strobes and umbrellas, also with a flash unit. If you currently have strobes and umbrellas: perfect! If you do not, you can buy some or maybe rent some in your area. If you feel you will never use studio strobes for anything else like portraits, but you have one or several flash units, then consider light stands and white umbrellas to attach your flash unit to. In this chapter, we’ll introduce you to the styles and types of architecture, the photography equipment most used in architecture photography, lighting systems and approaches, lenses and specialty lenses, lighting with strobes and flashes, and the difference between architecture vs real estate photography. Then we move into photographing exteriors, finding the best angles, exterior lighting, commercial exteriors, and then correcting for angles that are distorted. In this chapter we start off with night photography of building exteriors before moving on to lighting color management. Many building interiors have mixed lighting, and this can be a nightmare to work with when processing images. So, we’ll look at ways to minimize those challenges by getting it right in camera and lighting before talking the photograph. Finally, we’ll finish this chapter with a look at shooting for High Dynamic Range. This next chapter is all about shooting residential interiors. We’ll cover angles, interior lighting, supplemental lighting, finding the right angles, how to deal with problem windows, creating fake sunlight, and using strobe lights and flash units. This chapter is all about processing your digital files for final images. We’ll start with an introduction to Photoshop Layers, then move to processing HDR image files, followed by specialty techniques to solve problems like Photomerge, processing HDR, correcting horizontals, replacing windows and skies, replacing light fixtures, commercial signs, and more. 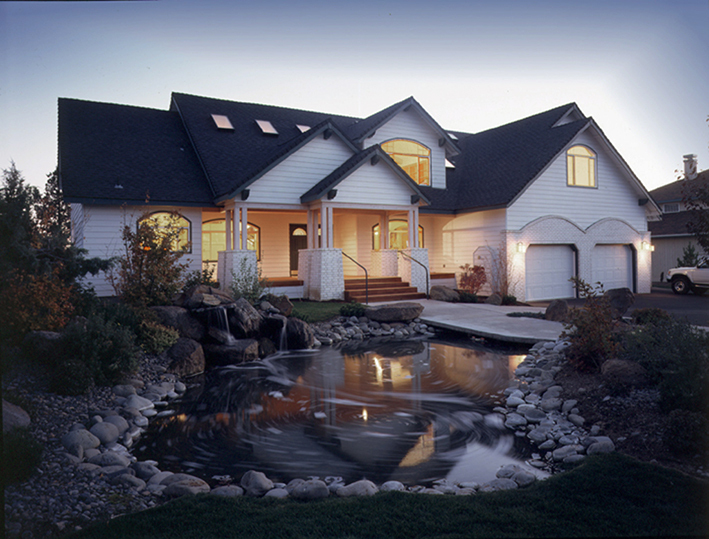 In this chapter, we’ll demonstrate how we photographed two custom homes. How we chose angles, dealt with lighting issues, and processed the photos. This chapter is about photographing commercial properties. We’ll demonstrate photographing office buildings, a large hotel, a complex hospital shoot, and techniques like removing power lines, and finish with several videos sent in by a student to this course, that needed lots of work. Also, a real estate shoot agreement, a price list, and contract are available for download.